Crockin Robin up for sale??? Short and sweet today guys and gals, its a Bank Holiday here in the UK and even blogs need an easy day….!! Talent is unquestionable BUT it’s no good being so talented but on the sick-bed for 3/4 of the season…???? 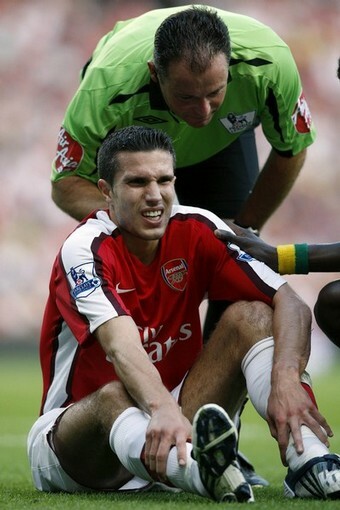 Robin van Persie, the most consistent absentee every season. One of the best players at our club, the new Mr arsenal I referred to him as yesterday, but…. When was the last season he played more than 30 games a season? How much have we paid him to be on the physio bench? How many times does he miss games for us, yet plays for Holland? How many times does he get injured for Holland, and in how many friendlies?? Arsenal Football Club need to get back to winning, not only games, but trophies. We need players who are fit, healthy and able to give a lot more to the team than Robin van Persie has been able to give over the last few seasons…. When he plays, he gives us something special, but when he’s missing, which is all too often, we lack something. How much longer are we going to carry this man?? So, what do you guys and gals think, keep him, or sell him now, before he gets injured so bad he won’t return? Sick of seeing this sight??? ?